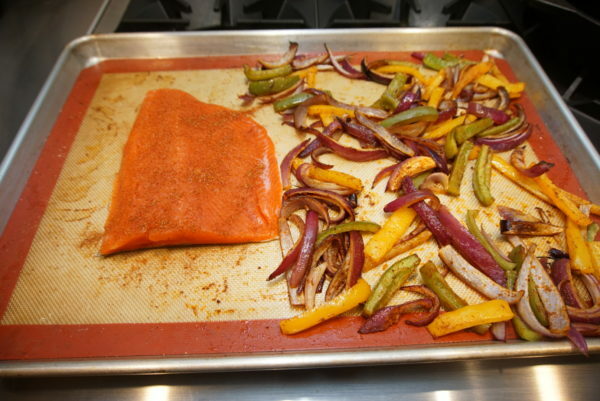 Place sheet pan in the oven to preheat at 425° F.
While oven is preheating, mix together the spice mix. The coconut sugar is optional. 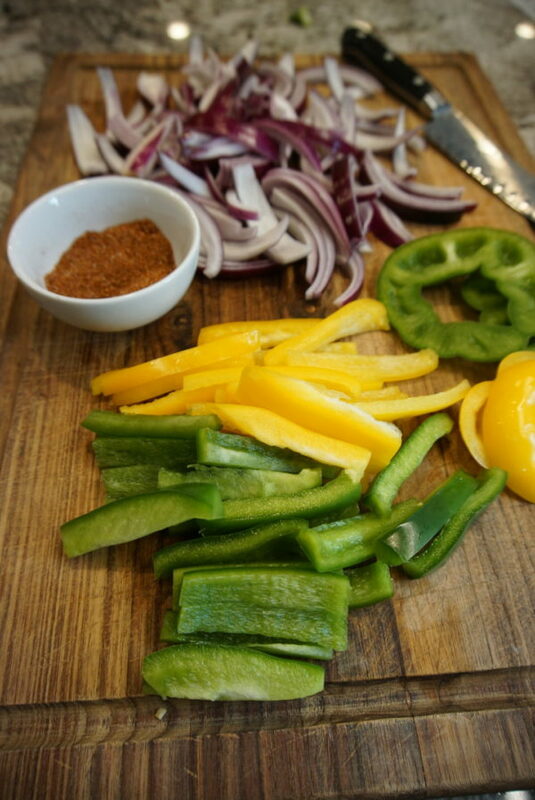 Coat onions and peppers in oil and 1-2 teaspoon spice mix. Place on baking sheet and bake 15-20 minutes, until the vegetables have started to brown on the edges. Take pan out of the oven. Turn the oven down to 300° F.
Place salmon fillets on pan. Sprinkle each with about ½ teaspoon seasoning each. Bake all together for about 15 minutes more, until salmon just flakes with a fork. I recommend pulling the pin bones from your salmon fillets before cooking. This is especially important if you are feeding kids. When I’m only cooking for my husband and me, sometimes I skip this step. If you don’t pull the pin bones, you must chew carefully to make sure you don’t swallow a bone. To pull out the pin bones you need a pair of tweezers. 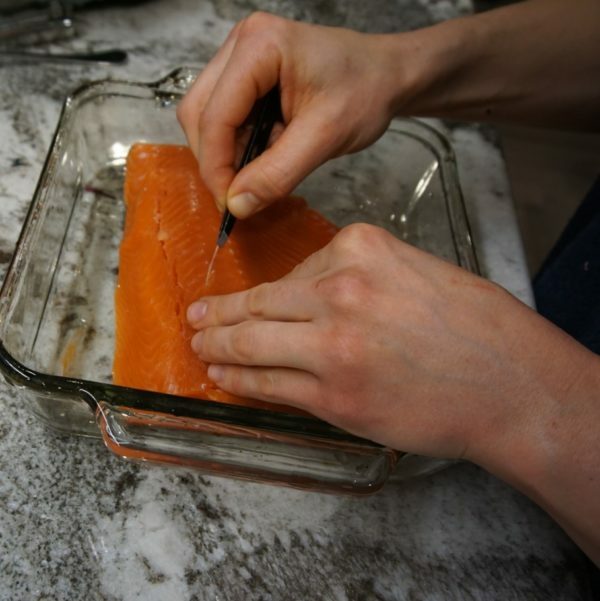 Run your finger along the midline of the fillet. When you find a bone, pull it out with your tweezers. Different parts of the fish have different numbers of bones. If your fillet comes from closer to the tail, you will find fewer bones. Use your finger to double check for more bones when you think you have them all. 1. 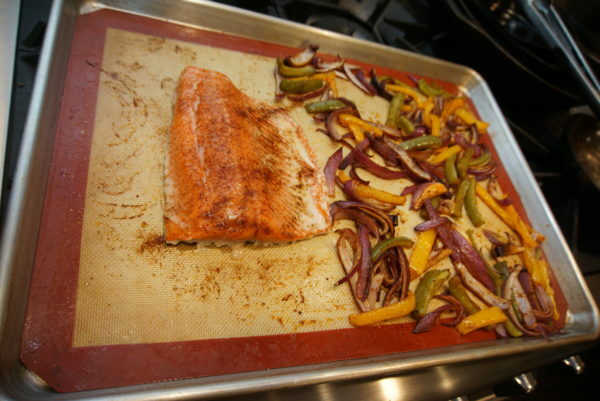 Place sheet pan in the oven to preheat at 425° F. I like these sheet pans. They are half sheet pans and I use them all the time. They may be larger than the pans you may already own, but I find them to be super useful. It is worth the investment to buy a couple nicer pans because they are thicker which prevents warping when they get hot. They are a great size for baking cookies or making Sheet Pan Suppers. I also have two silicon mats that fit my pans. I like silicon mats because they super nonstick and make clean up a breeze. 2. While oven is preheating, mix together the spice mix. The coconut sugar is optional, but only adds a couple grams of carbs total, in the whole meal. To me, it’s worth it because it helps balance all the flavors. If it isn’t worth it to you, leave it out. 3. Coat onions and peppers in oil and 1-2 teaspoon of spice mix. I use avocado oil because it has a high smoke point. Using expensive Extra-virgin olive oil would be kind of a waste because the high heat will destroy the delicate flavor and you wouldn’t taste it anyway. Vegetable oils, such as canola, are characteristically oxidize and promote inflammation in your body. 4. 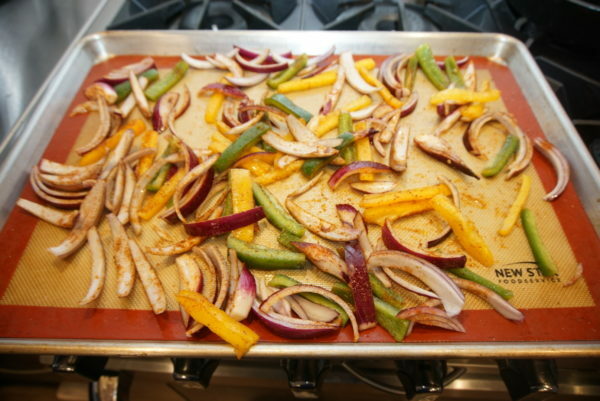 Place veggies on the baking sheet and bake 15-20 minutes, until they have started to brown on the edges. Pre-heating the pan will help brown the bottom and decrease the cooking time. 5. Take pan out of the oven. Turn the oven down to 300° F. Salmon likes gentle cooking. Studies have shown that high temperatures can degrade the astaxanthin (a good antioxidant) in the fish. 6. Place salmon fillets on pan. Sprinkle each with about ½ teaspoon seasoning. Feel free not to measure the spice mix. Trust yourself. 7. Bake all together for about 15 minutes more, until salmon just flakes with a fork. Don’t be afraid to undercook the salmon a little. It will continue to cook slightly after you take it out of the oven. Also, slightly undercooked salmon is way more enjoyable than overcooked, dried out salmon. Serve your fajitas in the way that makes sense to you. Honestly, this meal would taste good cold, the next day, as a salad for lunch. One thing I love about this meal is how flexible it is. You could offer a couple different options if you are cooking for a crowd. It would be a fun build-your-own meal for entertaining. If you are cooking for a crowd, make your life easy. Cute the veggies ahead of time – even the day before. The spice mix can be made in advance also (and any leftover can be saved for something else. Store in an airtight container). 9. Garnish with lime, cilantro, jalapenos, cotija or queso fresco and/or sour cream/Greek yogurt. I am a huge fan of garnishing. It really elevates the dish with little effort or skill. I try to always add something with color, usually a fresh herb or green onion. Next, I add something acidic to brighten up the dish. With this dish I like lime. If the dish needs some more texture I will add something crunchy.Salmon fajitas typically already have a variety of textures, so I don’t usually add nuts or anything (Not that this should stop you!). Lastly, I finish with a sprinkling of salt. If you have a nice flaky salt it will add some crunch. Sometimes I also use finely ground Himalayan salt, which doesn’t add texture, but really brings out the flavor. Gina Ciolkosz is a Personal Cook and Health Coach living in Anchorage, Alaska. She has a Bachelor’s of Science in Physiology and is an American Council on Exercise certified Health Coach. For the past six years, she has lived in Alaska, where she can’t get enough of the active Alaskan lifestyle that for her includes hunting, fishing, hiking, and the occasional weekend race. She loves to cook for people and enjoys the challenge of making healthy food taste delicious. Open Sky Fitness Podcast was the first podcast she came across, which helped her realize she wanted to work in the health and wellness industry.